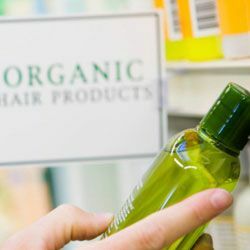 Organic and natural hair products can be beneficial to your hair and scalp, but they can also contribute to its demise. Many commonly used ingredients in organic products may lead to dry skin or scalp. Learning which ingredients to avoid can help keep your hair looking its best. What Causes Dry Skin & Scalp? Unfortunately not all organic and natural hair products are great for your hair. Research all products before using them in order to avoid problems resulting from the laundry list of ingredients found in shampoos or conditioners. Just because organic shampoos are manufactured without synthetic chemicals doesn’t mean they are chemical-free, as they do sometimes contain plant chemicals. If you see fragrance in the list of ingredients on the back of the product, this means that synthetic chemicals have been added, and you may not be getting the natural hair product you’re expecting. Some organic shampoos such as Aubrey’s Organic Primrose and Lavender Scalp-Smoothing Shampoo cleanse the scalp with primrose oil. This oil provides the essential fatty acids needed in order to soothe the scalp and not dry it out. Other ingredients that won’t cause dry scalp include florals and lavender. Look for vitamins A, C or E in natural hair products also since these are natural preservatives that can help hydrate your scalp. Containing salycylic acid, an ingredient commonly found in dandruff shampoos, willow bark is an ingredient actually found in nature. It is also used in skin care products because of its pore-opening qualities—the same quality that opens the hair follicles and removes buildup on the scalp. In addition to its great fragrance, peppermint oil is also an analgesic which helps heal inflammation on the scalp. Just apply it directly to your scalp. Guava is another analgesic that is also an antiseptic. Take a piece of guava, seed it and create a paste, apply it to the scalp and let it sit for an hour. Wash out the mixture with warm water. Neem oil may be the best natural remedy out there, and is readily found in the bark of many trees. Neem extract and/or oil will remove the itching feeling on the scalp and any redness as a result of the irritation. It can be applied directly to the scalp, and is also a great skin conditioner. While these are just some of the many at-home natural home remedies for dry scalp or skin, there are countless others that can help cure the irritation. Ultimately, knowing what ingredients to avoid when choosing organic and natural hair products is the first step to avoiding any dry scalp or skin issues in the future.